La Féderation Libanaise d’Escrime en collaboration avec le club Mont La Salle a organisé le samedi 15 mars 2014 la Coupe du Liban des moins de 16 ans de Fleuret féminin. La Fédération Libanaise d’Escrime organise, le samedi 15 mars 2014, la coupe du Liban de fleuret pour les moins de 16 ans (nés en 1999) pour les filles et les garçons. La FLE organise également, le samedi 22 mars 2014, la coupe du Liban de fleuret pour les moins de 18 ans (nés en 1997) pour les filles et les garçons. Les compétitions de dérouleront sur les terrains du Club Mont La Salle à partir de 15h pour les filles et à partir de 16h pour les garçons. The Lebanese junior fencing delegation, left Lebanon heading to the Jordanian capital Oman, to participate in the Asian Junior championship. 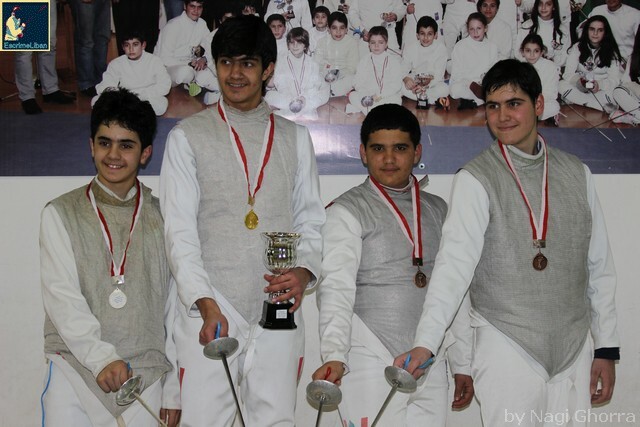 The delegation contains boys and girls, and is headed by Imad Nahas who is the fencing federation general secretary. Imad stated that the objective of the participation was to retain the Asian championship and prepare the team to the world championship coming up next month in Bulgaria, that allows qualification in the next youth olympics in Nanjing. Anthony Choueiry who previously who is the runner up of the Mediterranean championship and the West Asian champion. Rami Ghorra who is also a West Asia champion. Rami Baydoun the Arabs champion. Rami Bassel the uprising talent. Dominique Tannous, the youth Asian champion for the last 2 years. Rita Abou Jaoudeh the Arabs and West asian champion. Nour Farhat, also a West Asian champion. Jasmine Farhat, who is a very promising talent. The girls delegation will be missing Mona Chaiito, the olympic and Asian Champion who is ranked 6th in the world, due to academic obligations! غادرت إلى العاصمة الأردنية عمّان، بعثة منتخب لبنان للمبارزة، للمشاركة في بطولة آسيا للأشبال والناشئين. وضمت كل منأنطوني الشويري، حامل فضية بطولة البحر المتوسط وبطل غرب اسيا، ورامي غرّة بطل غرب اسيا، ورامي بيضون، بطل العرب، ورامي باسيل،الذين يشاركون في سلاح الشيش وسيف المبارزة، ودومينيك طنوس، حاملة اللقب الآسيوي للناشئين للسنتين الفائتتين في سيف المبارزة،وريتا ابو جوده، بطلة العرب وغرب اسيا، ونور فرحات بطلة العرب ايضاً، وياسمين فرحات، وتغيب منى شعيتو، اللاعبة الاولمبية وحاملة لقب بطولة آسيا في الفئة العامة والمصنّفة سادسة عالمياً، لإرتباطات جامعية.